Recently a case control study of 124 pregnant or post-partum mothers showed that periodontal disease represents a clinically significant risk factor for pre-term low birth weight babies. If the mother had periodontal disease, there was a seven-fold chance of delivering a pre-term low birth weight baby. The low grade bacterial infection and the resulting immune system reaction appears to cause premature contraction of the uterus. Further investigations are underway in our office in collaboration with Foothills Hospital. There appears to be an increased risk of lung infections for those with active periodontal disease and poor oral hygiene. The bacteria from the gums may travel to the lungs and cause serious infections. This process may infect patients in intensive care units and nursing home residents who are at greater risk for bacterial pneumonia. Studies show that periodontal disease may also be a risk factor for heart disease and stroke. Individuals with periodontal disease have been shown to have double the risk for coronary artery disease. It is believed that the periodontal bacteria infection can cause blockage of the heart blood vessels and create these serious health problems. Diabetics are more susceptible to periodontal disease. However, with good periodontal disease control and elimination of the chronic periodontal infection, blood sugar levels in diabetics tend to stabilize. In this way the damaging effects of Diabetes can be minimized. Osteoporosis also appears to be a risk factor for periodontal disease due to an alteration of the metabolism of the calcium in the bone. Medications that build up the calcium in the bone will help to reduce the periodontal risk factor. A recent study in Australia revealed that individuals with Rheumatoid arthritis have an increased risk of tooth loss as a result of periodontal disease. It seems that the activity of the immune system is the main reason for the tooth loss rather than the level of oral hygiene. Men with gum disease apparently have a 63% increased risk of developing Pancreatic Cancer according to a Harvard based study. The study appears in the journal of the National Cancer Institute in 2007. Mouth bacteria and the body’s attempt to fight them may produce carcionogenic ( cancer causing) chemicals which may trigger the disease. However the exact connection is unclear, particulary if the mouth problem is causing the cancer or whether something unrelated is causing both. Writing in Lancet Oncology, the team, who studied the health records of 50,000 men, said an immune system weakness could cause both illnesses. 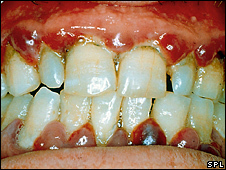 He said: “The first thing to remember is that gum disease can be treated and prevented. “We should really be encouraging people to visit their dentist frequently, although many people do have trouble finding an NHS dentist.